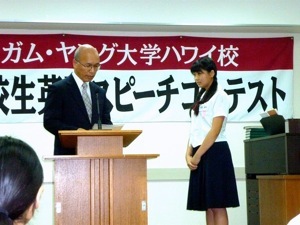 Today, one of my junior high school second grade students got fifth prize at the Takamado Speech Contest. I'm really proud of her. Unfortunately, I don't have any pictures because I was at another contest! 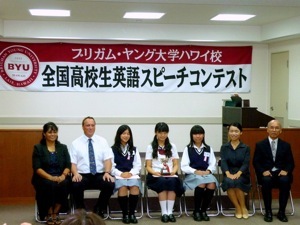 One of my high school second grade students went to the Brigham Young University speech contest in Hiroshima yesterday. 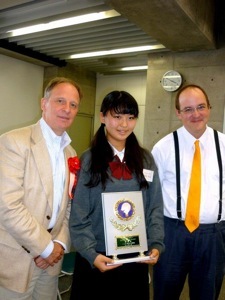 She got first prize! Her speech was about helping families appreciate children with autism. 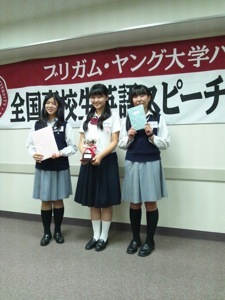 Then, today, at the Notre Dame Seishin University speech contest, she got first prize again with a completely different speech. This speech was about the meaning of family. I'm SO impressed that she was able to keep track of two very different speeches. We currently have 7 girls on our English debate team. We have four second graders and three first graders. We're currently meeting twice a week. They are SO great. They are so motivated and hard-working, and they have super attitudes. The first graders talked about Christian, a lion cub bought by two young Australian men in London in 1969. The students had a debate about exotic animals. The students also had a conversation about bullying. The second graders talked about recent legislation proposed in Europe to ban plastic bags. The third graders talked about an article by Bernard Hare about good Samaritans. They had a debate about special fares for people in emergency situations. They also had a debate about whether or not we should have a paperless society. The high school first graders wrote several essays: a couple of descriptive essays and a couple of procedural essays. During oral communication, the first graders practiced onomatopoeia, gestures, facial expressions and posture. Here are the junior high school second grade NELP students in reading class.